If you’re an aspiring jewelry designer, Etsy is an amazingly convenient website where designers from across the globe can come together to make, buy and sell beautiful handmade work. Especially for those looking to make money with their jewelry design talent, learning the best ways to take advantage of Etsy’s sales opportunities can be a super helpful way to get your brand’s name out there and create a following for yourself. If you’re new to jewelry design altogether, consider checking out our simple, online jewelry design course. 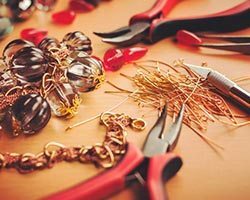 We mail you everything you need to complete a series of design projects throughout the jewelry design course, including beads and a full tool kit. These projects will be submitted by you, then evaluated by your mentor, an experienced jewelry designer who will give you feedback and help you master the skills taught in the course. If you do not already have an Etsy account, you will need to create one. Go to www.etsy.com and click Sign In, then click Register to create a username and password. You’ll be able to make an Etsy username and password there. Next, you will need to come up with a unique name for your online store. If you have a brand name already, or if you sell your work in a brick and mortar store, we strongly recommend keeping that same name if possible, in order to increase cohesive brand recognition among your clients. However, Etsy recommends that you have a few options ready, just in case your first choice is already taken. Try adding the word “shop” or “boutique” to the end of your desired name if you can’t get the one you wanted on the first try (so if we tried NYIAD and it was taken, for example, we could then try NYIADShop). Before you launch, you need to have at least one item ready to sell. However, we strongly recommend you develop more of a broad collection before moving your brand online. If potential buyers login and see just one piece being sold, they might get the wrong impression that you aren’t a serious designer and don’t make as many products as you actually do. You’ll also need to have digital product photos of your items ready to go. This is crucial to sales. No matter how beautiful your designs look in real life, online shoppers won’t get a great impression if they see blurred, sloppy images of your work. So take your time with these photos. Make sure to zoom in on any important details, and try to keep the background clean and simple. For a complete guide on how to photograph jewelry, click the link for our tutorial. By: Michelle Ecker on April 5 2017.